This free online calculator will help you to find the area of a sphere surface. Using this online calculator, you will receive a detailed step-by-step solution to your problem, which will help you understand the algorithm how to find sphere surface area. Sphere is the set of points that are all the same distance r from a given point in space. 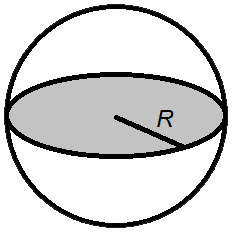 This distance is called the radius of the sphere. The surface area formulas of a sphere is 4 times radius squared multiplied by π. Surface Area Formulas for Geometric Shapes.